Does It Really Pay to Have Friends? 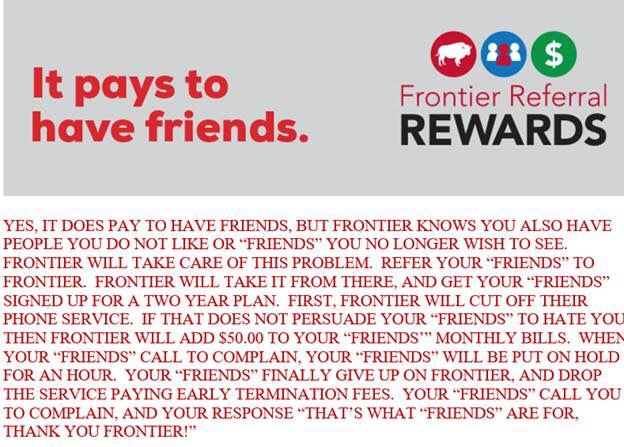 Imagine my surprise when I received an email from Frontier Communications entitled “It Pays to Have Friends.” Let me tell you the facts. A few years ago Verizon sold most of their phone lines and internet services outside the Chicago area to Frontier Communications. In April of 2016, Verizon sold their cable, phone, and internet operations in Florida to Frontier. In both states you thought you had Verizon, but then ended up with the third world service of Frontier. If you want to keep your Friends, don’t let them sign up with Frontier. Frontier is absolutely one of the worst companies I have ever dealt with. If you have Frontier, my advice is to get rid of them as soon as possible since you will continue to have nothing but problems. And if you are fortunate enough not to have them, don’t fall for any of their offers! This entry was posted in Business and tagged frontier, frontier communications, frontier florida, frontier illinois on September 24, 2016 by Good Day Illinois. 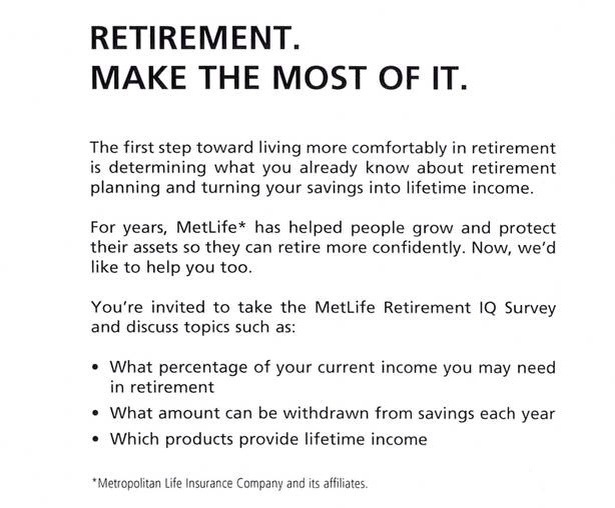 MetLife Will Help You with Your Retirement Planning – In Freeport We Know They Are Experts! It’s nice to know that MetLife wants to help us with our retirement. In Freeport it is closing its office forcing hundreds of employees into mandatory retirement. Will, I guess MetLife is an expert on retirement. Just ask those Freeport employees who no longer have jobs. Next time you see an ad for MetLife, think about that empty house next door, or your former friends who were forced to move to find a new job. Freeport will be living proof as to MetLife’s retirement expertise. 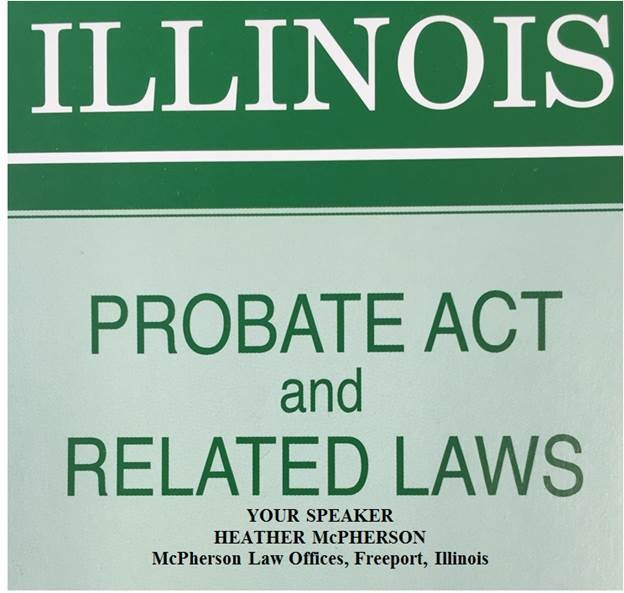 This entry was posted in Business, City of Freeport and tagged freeport illinois, MetLife, metlife taking jobs, retirement on June 23, 2014 by Good Day Illinois. What Hasn’t Changed in Forty Years? Buying a Car Is Still Pure Hell! Your car is getting older and you think it may be time to buy a new car. Having been fairly happy with present car, you go to the dealer who sold you the car. You indicate you would like to trade in your present car for a new model of the same car. All of the service on your car has been done at the dealership. You know you paid a premium for the service over the years, but you thought it would be worth it when you got ready to sell it or trade it in. Dream on! While you go for a test drive, the dealer appraises your car. When you get back, the sales person sits down with you and gives you the cost of the new car which has only been discountly slightly. You are told there is great demand for this model! Now the sales person says, I know you will not be happy with the value placed on your car. You are then given the amount the dealer will give you for your car which is substantially less less than the Kelly Blue Book trade in value. Shocked, you ask why so low? Then the sales person gets the used car person (they always work in tandem), and you are told that the market for your car is not good since only four wheel drive vehicles with snow plows are selling at this time. In disbelief you say you sold me this car and now you tell me it is worthless! They say nothing and you leave in shock. So much for buying a new car! 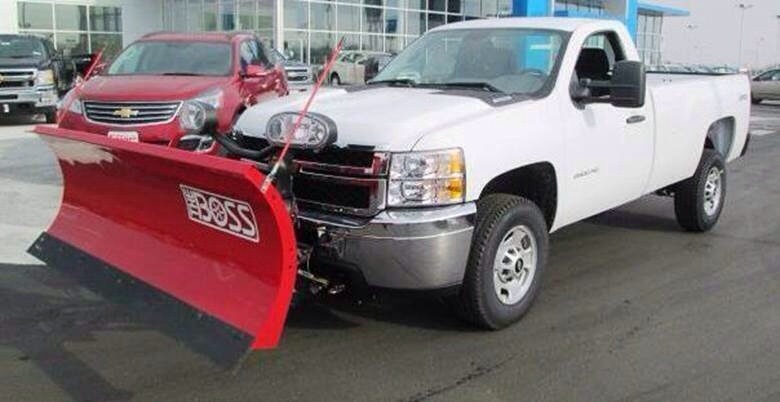 This entry was posted in Business, Weather and tagged buying a car, car shopping, cars, winter 2014 on March 6, 2014 by Good Day Illinois. City Council Chambers at 524 West Stephenson Street, 3rd Floor. Wonderful – 2 more people to enforce new Rental Registration Ordiance. Resolution to give Downtown Development Foundation $50,000. This shows what is important in Freeport. Rental properties and the downtown. Reach your own conclusions! Approval of bid from GO Escavating, Inc., Freeport to demolish 2 buildings at 212 N. Cherry Avenue and 910 S. Galena Avenue in the amount of $19,500. This entry was posted in Business, City of Freeport, Politics and tagged Freeport City Council, hiring more employees, mayor gitz, rental housing on December 16, 2013 by Good Day Illinois. We Will Miss Our Mail Carriers Who Are The Best! 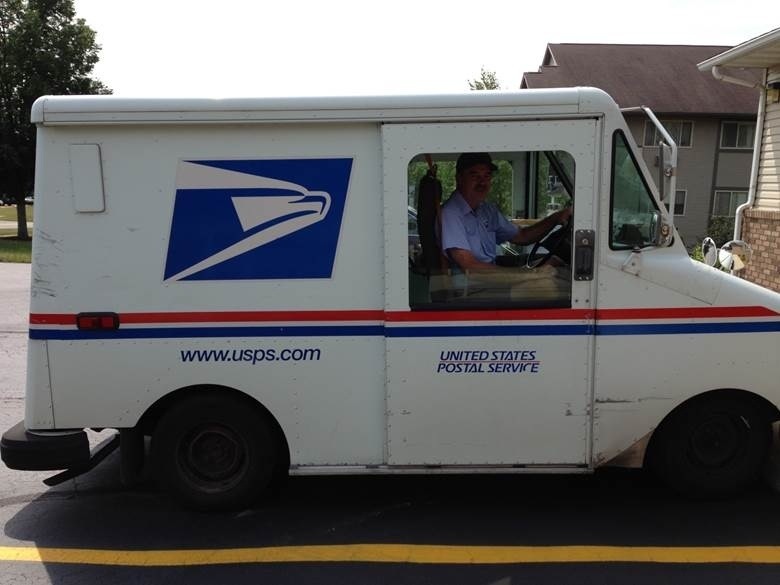 The post office to save money will probably stop Saturday delivery in the near future and the cost of stamps will be going up again. Delivery to a mail box attached to your residence will also end with everyone having to put a mail box along the street or go to centralized pickup boxes. This is already the case in newer neighborhoods. What an ugly sight – all those mail boxes on every street! Our mail carriers are the best. They know their customers, and often are the first to notice that something is wrong. We will pay a price for these changes, and you cannot put a dollar value on what we will lose. Our mail carriers not only say “You Have Mail,” but they ask you “How are you?” And they mean it. We are losing part of America and it is sad. This entry was posted in Business, News, People and tagged changing america, letter carriers, mailman, USPS on December 5, 2013 by Good Day Illinois.